There’s chowder and then there’s CHOWDER! This cheeseburger chowder from our friends at Barstow’s Longview Farm in Hadley, Massachusetts definitely falls into the latter camp and will elevate your chowder making game. 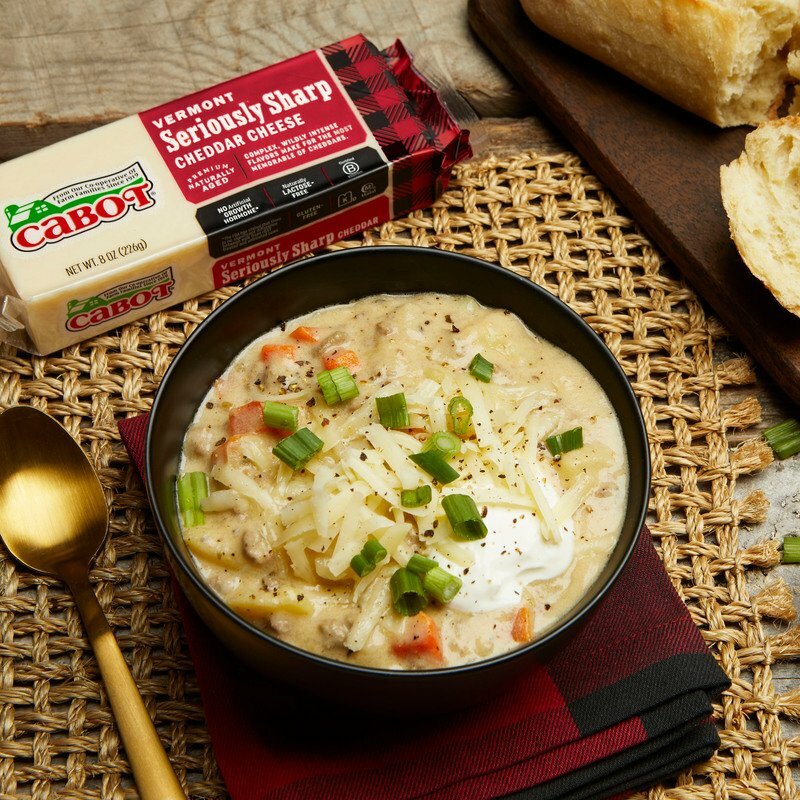 With a variety of vegetables, ground beef, seasonings, Cabot Sour Cream and Cabot Seriously Sharp Cheddar Cheese, this chowder is in a class of its own. If you’ve never made chowder before, not to worry, as this delicious recipe is actually really simple to make - the most work is in the prep, with chopping and dicing the ingredients. Watch the video above, get your ingredients ready and the rest is easy-peasy. Share this farmer recipe with friends and family on Facebook, Pinterest, Instagram, and Twitter. To make 4 servings, begin by browning ground beef in a soup pot. Remove any liquid and set aside. Next, sauté chopped onion and 4 tablespoons of Cabot Salted Butter in the same pot. Add garlic cloves, diced carrots, basil and parsley, sautéing for about 3 minutes. Add the chicken broth, cooked ground beef and diced potatoes. Bring to a boil then reduce heat, cover and simmer 15-20 minutes. Melt the remaining 2 tablespoons of butter in a small pot, add flour and cook, whisking for about 3-5 minutes. Gradually add evaporated milk, whisking constantly for 6-8 minutes. Stir the sauce slowly into soup and bring to a boil. Cook for 2-5 minutes, until thickened. 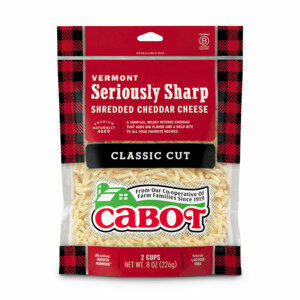 Reduce heat to low and slowly add shredded Cabot Seriously Sharp Cheddar Cheese, salt and pepper. Stir until cheese melts. 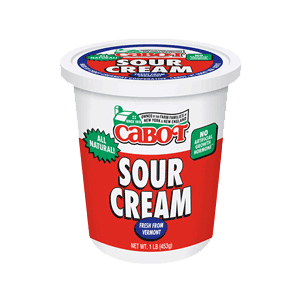 Remove from heat and blend in Cabot Sour Cream. If you love this chowder recipe, you’ll want to try Barstow’s Longview Farm’s Cheddar-Corn Chowder next. As a co-operative of over 800 farm families, our goal is to make the highest quality and best tasting cheddar cheese and dairy products you’ll find. We’d love for you to rate and review this cheeseburger chowder recipe once you’ve made it! BROWN ground beef in a soup pot, remove any liquid and set aside. SAUTÉ onion and 4 tablespoons of butter in the same pot. Add garlic, carrots, basil, and parsley and sauté 3 minutes. ADD chicken broth, cooked ground beef and potatoes. Bring to a boil then reduce heat, cover and simmer 15–20 minutes. MELT the remaining 2 tablespoons of butter in small pot, add flour and cook, whisking for about 3–5 minutes. Gradually add evaporated milk, whisking constantly for 6–8 minutes. STIR the sauce slowly into soup and bring to a boil. Cook for 2–5 minutes until thickened. REDUCE heat to low and slowly add cheese, salt and pepper. Stir until cheese melts. Remove from heat and blend in sour cream. Recipe courtesy of Barstow’s Longview Farm, Hadley, MA.